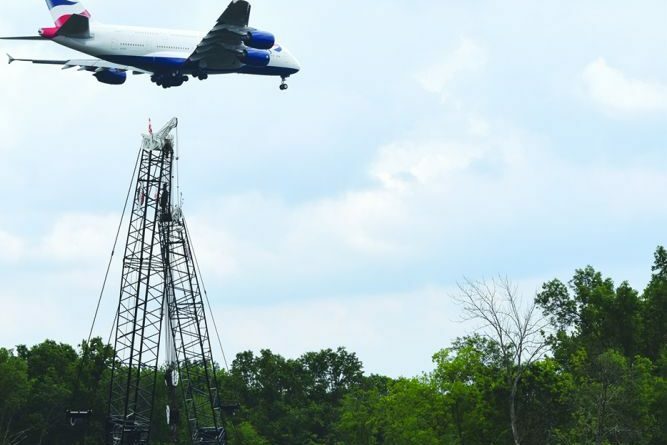 A British Airlines flight glides to a landing over the Silver Line construction zone at the northern edge of Dulles Airport. The Metropolitan Washington Airports Authority has released its newest projections of noise around Dulles Airport when operating at full build out. The updated study could impact county plans for development around the airport. The projections lay out what parts of Loudoun and Fairfax are expected to be most affected by aircraft noise once the airport reaches its planned full capacity of five runways and about one million flights a year—about four times the number of flights last year. They generally show more Loudoun land experiencing substantial jet noise; although, some areas directly in line with the airport’s current and future east-west runways are now expected to be less impacted. That includes jet noise stretching as far north as Seldens Island and the Potomac River, crossing over the 1757 Golf Club, One Loudoun, and Bles Park, where previously that level of noise stopped short near the Barn at One Loudoun and Savin Hill Drive off Russell Branch Parkway. There is also slightly more noise expected near Loudoun’s easternmost Metro station. The high-noise zone is also now expected to reach further south and west of the airport, such as over Mercer Middle School. But it estimates that some areas immediately south of the airport in Loudoun will actually hear less noise than previously calculated. That noise had previously been expected to reach across South Riding to Loudoun County Parkway and Braddock Road. The authority’s noise maps include two levels of impact, based on average noise over a 24-hour period, with noise at night weighted more heavily. It anticipates about 82 percent of the airport’s million annual flights will be passenger aircraft, and about 74 percent of flights will be large jets. Loudoun County supervisors adopted the airports authority’s previous noise maps in planning policies and zoning regulations, which generally forbid residential development in the high-noise areas—meaning a change in the noise maps could limit options for owners of undeveloped land near the airport. For example, the high-noise zone boundaries were the deciding factor when supervisors in 2016 decided not to partner with the Windy Hill Foundation to renovate and build affordable housing at the Old Arcola School, which is in an area previously expected to see the heaviest airport noise impact. Under the new study, that area is now expected to be downgraded to an area that is still affected by airport noise, but where residential development is acceptable under county policy. Supervisors Matthew F. Letourneau (R-Dulles) said the changes could have especially impact landowners in his district near Rt. 50. He said those landowners are actively looking into what they can do with that property already, and if the county adopts these new noise maps, it could take some options off the table for them. County planners are still waiting to get detailed versions of the maps from the airports authority. In the meantime, the authority has scheduled a public meeting on the new maps for Thursday, Feb. 28 at Dulles Airport. More information is at flydulles.com/iad/dulles-international-noise-contour-map-update. 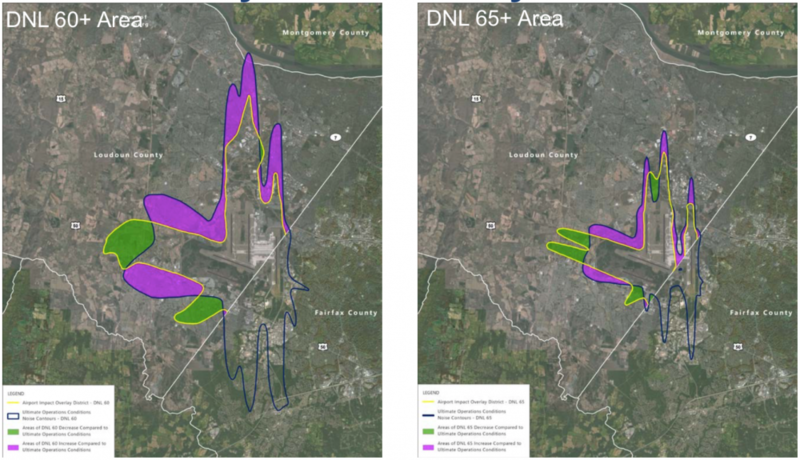 Maps depicting the airport noise districts as adopted by the county Board of Supervisors compared to the Metropolitan Washington Airports Authority’s new predictions of what areas will be noisiest when Dulles International Airport is built out.